With promises of improved efficiency and safety, many owners are facing the reality of increased autonomy in the shipping industry. Aker Arctic’s Autonomous Ship solutions can help you stay on top of changing technology trends and come out as industry leader. Aker Arctic has engineered the DIVEC™ system as an economical way to develop and test automated controls prior to exposing them to full-scale conditions. Aker Arctic’s ice model basin is fully equipped to enable testing of new technologies and automated control systems that will pave the way to autonomous shipping. We have developed our DIVEC™ framework to allow any existing software and hardware to be easily tested in model scale. Control systems can seamlessly power conventional propulsion, podded propulsion, and transverse thrusters allowing customers to develop any vessel configuration. With completely wireless control, models are free to move throughout the ice model basin unimpaired by the testing apparatus, providing real insights into the behaviour of the vessel. 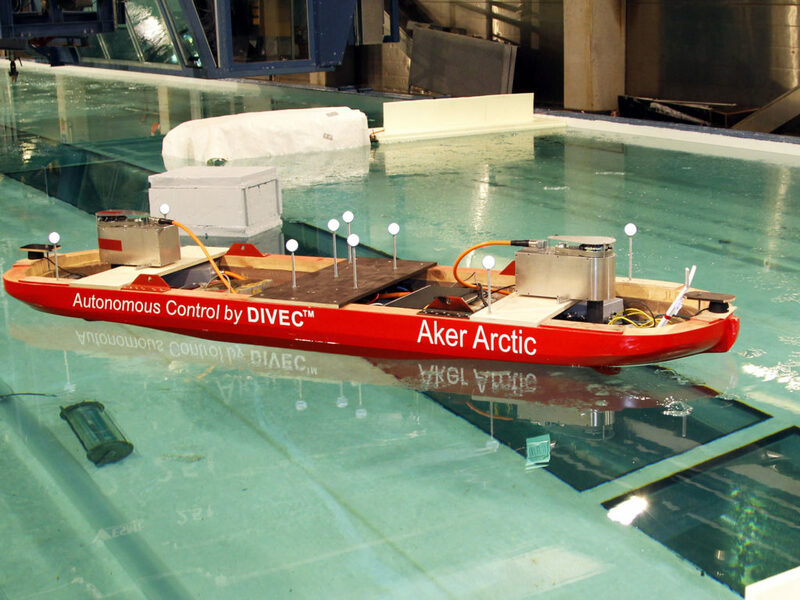 All the benefits of Aker Arctic’s model testing services can be used to test autonomous ships, providing an economic and safe way to verify the vessels performance. And see the video on our youtube channel.